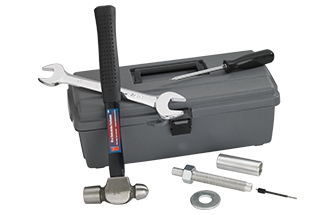 The lock extractor kit from Highfield has been engineered for fast, efficient removal of inoperative barrel locks from any type of security hardware on a utility system. The unique design of the extractor element utilizes a reverse taper pin. This allows the lock to be “grabbed” by the inside diameter of the keyhole avoiding damage to the surrounding hardware. In many cases, the equipment may be re-used after extraction of the lock.